Can backpacks be cool for kids and healthy too? 03 Sep Can backpacks be cool for kids and healthy too? With new technology, our habits have changed and children have become less active than in the past. In fact a study published by the NHS in December 2016 found that only 22% of children aged between 5 and 15 met the physical activity guidelines of being at least moderately active for at least 60 minutes every day (23% of boys, 20% of girls). Less activity is not good news for children’s health but also the wrong type of activity can also cause problems. A great way to incorporate more activity in to your child’s day is to encourage them to walk to school, which means carrying schoolbags. If you take a look around you on the school run you will see children carrying all kinds of bags. Smaller children seem to be wearing backpacks but they’re less common with teenagers where fashion seems to prevail over function. Using a backpack incorrectly can cause pain in childhood and may contribute to future spinal problems. So what should you look out for and how can your child best use a backpack? We generally do not associate back pain with children and, like many symptoms or illnesses, we often have the attitude that “they are kids; they will get over it and bounce back” which they generally do. So do children get back pain? They certainly do; however it usually short term in nature. Severe back pain in a child is rare and should always be investigated by a health professional. 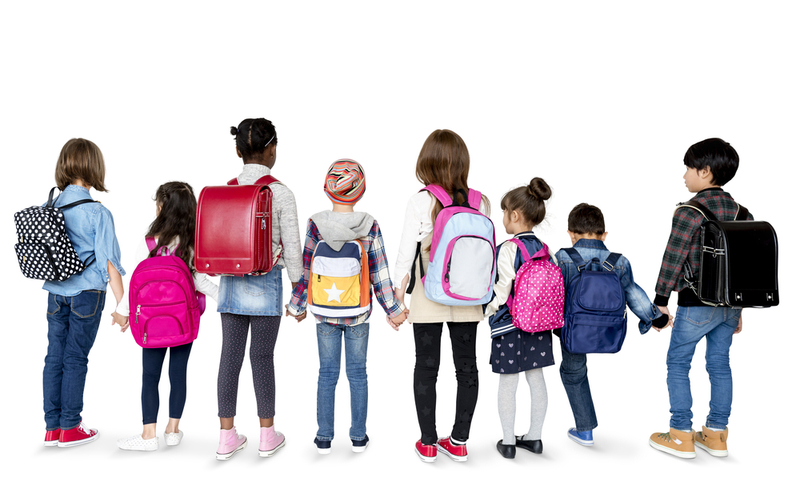 A study by Professor Dr Shelly Goodgold Sc.D P.T, a physical therapist at Simmons School of Health Sciences in Boston, found that 55% of the 345 children in the study regularly carried more than the recommended 15% of their body weight in their school backpacks. A third of the students in the study reported back pain. The age range was from grades 5 – 8 and it was noted that the younger children carried proportionally more weight as a percentage of their body weight than the older children due to their smaller size. A backpack with increased weight can alter a child’s posture and distort the curves of the spine. This can result in muscle fatigue and pain. The child may also develop a forward head posture which is a postural distortion commonly seen in our Chiropractic practice. Forward head posture is also a symptom of staring down into a mobile phone or tablet for prolonged periods of time – “text neck” is a coined phrase for this phenomenon which we are increasingly seeing in kids and teenagers today. The way a bag is carried can change walking patterns as well as altering standing postures. Carrying a bag on one shoulder, whether a backpack or sports bag, promotes a bend in the spine, whereas using both straps over each shoulder does not. Carrying a backpack does, however, result in a greater forward lean of the head and body in comparison to single-strapped bags. The Chiropractic viewpoint is that the structure and function of the spine and how it relates to the nervous system and our overall health is most important. A symptom can be viewed as a message or signal to alert us that our body is under a stress of some sort. This is therefore a healthy response and not something to be ignored or blocked by painkillers. Prevention can play a role in addressing the posture before the onset of symptoms. While wearing a backpack on two shoulders will reduce side bending, if it is too heavy it will promote forward head posture and leaning, which may also lead to problems in the future. Improve the ability of the body to handle the load. A chiropractor can help on both counts, firstly by giving advice and secondly by improving the spinal function where necessary. Backpacks should be no heavier than 10-15% of the child’s body weight when packed. The backpack should be sturdy and the right size – no wider than the child’s chest. Choosing a pack with broad, padded shoulder straps. Using both shoulder straps – never sling the pack over one shoulder. Using the waist straps attached – they’re there for a very good reason. Not overloading the backpack – use school lockers and plan homework well in advance. Placing all heavy items at the base of the pack, close to the spine. Using compression straps and also using the inner pockets rather than the outermost pockets, to keep the load close to the spine. The important features in choosing a backpack are that it is the correct size; it should not be too low or wide, and the shoulder straps should be well-padded and wide. Compression straps on the side are also useful to stabilise the contents, as well as a waist strap to take the load on the hips. The waist strap should rest just on top of the waist bones and should not be too tight; with the waist strap attached there should not be significant weight on the shoulders, enabling two fingers to be inserted under the straps with the pack on. Depending on the size of the backpack it is useful to have internal compartments to separate and stabilise the load. What we do today will determine our health for tomorrow. So while encouraging our children to exercise and walk to school it is important to make sure they get the most benefit possible by wearing their properly fitted and, of course, fashionable backpack!